If you enjoy both history and fixing things, then you may have trouble driving by historic homes for sale in Scottsdale without feeling the urge to buy and fix one up. Before you do, however, you should know the three R’s of fixing historic homes — Restoration, Renovation, and Repair. Restoration “Restoration” is the process of returning a home to its original state. Restoring historic homes often requires city and state permission. It’s essential that you check to see whether your home is listed in the National Register of Historic Places (NRHP); or, whether it’s located in a historic district. If either is true, there may be a specific set of rules to follow while renovating. Restoration can be an expensive endeavor. For a home to keep its historic value, the materials used must match the home’s original materials, including furnishings. This can be costly because of antique value. Renovation Renovating is less complicated and less restrictive as compared to restoring. However, via a renovation, a home often becomes a more “modern” living space, which can lower the home’s historic value. 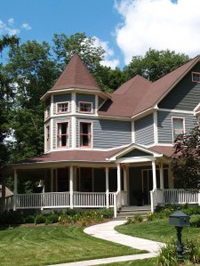 Be sure that your home is not listed in the NRHP or located in an historic district before beginning renovations. Depending on size of the project(s), renovations can be expensive, too. However, it’s easier to find great deals on modern appliances as compared to the antique appliances required for a restoration. Repair Repairs are often less intensive than a restoration or renovation. For repair, be sure to use materials which fit the home’s character, which may include plaster walls and wooden floors, for example. Matching original materials is not important in the home repair process.. The cost of a repair project will depend on the size and volume of required repairs. The differences between a restoration, renovation and repair of an historic home may be minor, but those small differences will change your costs, your timeline and your procedural red tape. Speak with an qualified architect if you’re unsure of your obligations as the owner of a historic home.